Mukurthi National Park, an extremely picturesque park is located on the south eastern corner of the elevated Nilgiris Plateau in Tamil Nadu. The park forms a part of the Nilgiri Biosphere and is one of the two National parks in the Nilgiri district. Mukurthi extends to an area of 80-sq. km (7846 ha) at an average elevation of about 2400m. This park has a wide variety of flora and fauna similar to the Himalayan Flora and fauna. The terrain, primarily grasslands is characteristically interspersed with numerous isolated, compact, sharply defined montane wet temperate mixed forests locally termed 'Sholas' with beautiful brooks. The sholas have savannah woodlands, and evergreen trees which are more stunted than those in lowland evergreen forests. Billithadahalla, Pykara and Kundah rivers flow through the park. Nilgiri Thar (Hamitragus hilocrius) is the main attraction in this park. Besides that Sambhar, barking deer, Nilgiri marten, otter, jungle cat, jackals etc are the commonly found animals. The bird population includes Laughing and whistling thrushes, woodcock, wild pigeon and black eagle etc. The park also has large varieties of butterflies that includes blue admiral, Indian red admiral, Indian Cabbage white, Hedge blues, Rainbow trouts and Indian fritillary, which has a similarity to the Himalayan Butterflies. Among the park's highest peaks are Devabetta (2553 m) and Mukurthi, which offer some of the best views of the Nilgiris. At the foot of the Mukurthi hill (8380 ft), 9 km from the peak lies the Mukurthi dam which also is a must see place. 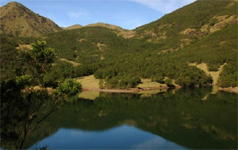 Nilgiris gentle slopes and cool climate offers easy trekking. There are no entry permits needed nor it is essential to hire a guide in these trek routes but it is good to inform the District forest Officer especially if you are going on a long trek inside the park. For adventure seekers, there are trek routes and camping facilities. Trekking is enjoyable in Parson's valley, Porthimund and Pykara as the areas have a pleasant climate and beautiful scenery. Mukruthi lake is great for trout fishing. Permission must be acquired from the Director, Fisheries Department, Udhagai. There is a trek from the picturesque Parson's Valley to Porthimund, a village lying deep in the hills. One could pitch a tent here for the night, before proceeding to Mukurthi. There is a forest bungalow here for stay. 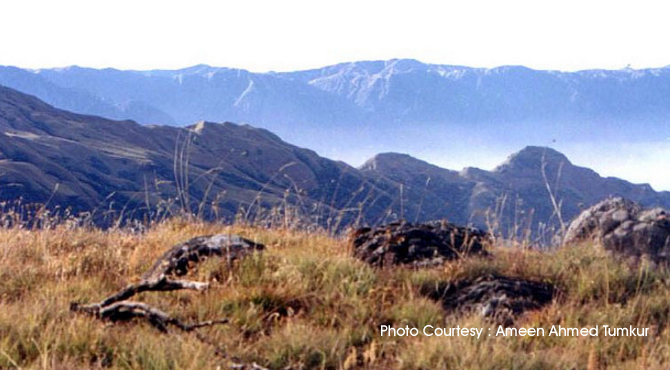 From Mukurthi, you can trek north to the Pandiar Hills, and pitch a tent for the night. Then to the Pykara Falls, along the Pykara Lake. For trekking details contact Nilgiris Trekking Association, 31 D, Bank Road, Ooty. The park is open on all days from 9.00 am to 5.30 pm except Tuesdays. Entry Fee : below five years - Free, Children above five years and below 12 years - Rs.10.00, School Children (Age 5 to 12 years) from Government and aided Schools - Rs.2.00, School Children from Private Schools (Age 5 to 12 years) - Rs.10.00. Adult : 15.00. Still Camera: Rs.25, Handy Camera / Video Camera - Rs.150, Charges for documentary educational films using Handy camera and Video Camera - Rs.2000.